So says the above invitation to all women who attend Harvest Bible Chapel. How could a woman pass up an invitation when it is presented to her in such an alluring manner? After all, what woman would turn down an invitation from –God? 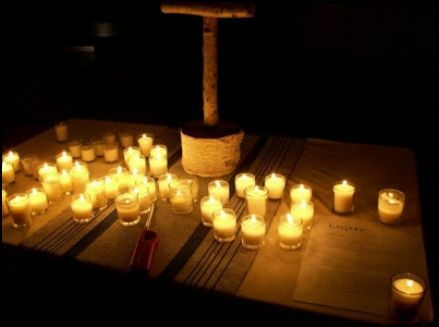 What comes to mind when anyone uses the term “meditation stations” is what I have seen in videos that shows what takes place at churches that are involved in the Emerging/Emergent Church Movement. They have sectioned off areas where prayer altars have been set up for those who attend such gatherings, so that the participants can pause and reflect or meditate, such as the prayer/meditation station pictured below. On April 2, 2010 when I was still attending Harvest Bible Chapel Rolling Meadows, their Good Friday service was set up in a similar manner. There was a station where a six or seven foot cross was laying flat on a table so that each person could write their name on the cross with a marker as a reminder that Jesus died in our place, and another station where a video continuously played featuring a doctor who shared in great detail, the effects that flogging and crucifixion had on the human body. In another station there was an artist who sat drawing a scene related to Jesus’ death. Everything was set up in such a way that they caused you to engage all of your senses. I must admit that it was a very moving experience, but that was the problem. Because even though it did cause me to reflect upon the pain that Jesus endured, I couldn’t stop thinking of the similarities of these stations that were set up and the stations that I saw in the many videos that I had seen concerning the Emergent Church Movement and how everything is geared towards the worshipers having an experience with God by having them see, touch, smell, taste, and hear things. I left that night feeling very troubled. What I truly enjoyed were the Good Friday services that they had in the past where all that you did was either come into the worship center where quiet Christian music was being played and there was an atmosphere of reverence as different Scriptures were shown on a screen at the front of the church and you could stay for as long as you wanted and leave in silence as you walked out to your car. Or there were other years when you would just come into the worship center and reflect on the Scriptures that were projected onto the screen to prepare your heart for a drama of the reenactment of the crucifixion, or the days leading up to it, and hear God’s Word being read. But that Friday night in April of 2010 simply added to the concerns that I already had because of my awareness of the dangers of the Emergent Church Movement in which there is a moving away from Scriptural truth and instead the focus is more upon having experiences with God. The speaker for Harvest Bible Chapel’s women’s retreat is Shannon Milholland. When I searched YouTube hoping to find a video of a conference that she had spoken at in the past so that I could test what she said against Scripture, there were none to be found. First I found an old comment that Shannon had made on a post by Robert D Smith who I discovered is a motivational speaker. He wrote a book called “20,000 DAYS AND COUNTING” which tells you to figure out how many days that you have been alive so far, and to live the rest of your days one moment at a time and to make them count. He speaks about God in some of his writings, but instead of telling his readers to renew their minds with the truth of God’s Word, his advise sounds more like positive confession teachings that can be found in the Word of Faith Movement, or the mantra’s uttered over and over by those involved in the New Age Movement, and not like Christianity at all. In Robert D Smith’s book under ‘Section 1 Point 4’ of his Notes section, it shows that he quoted Norman Vincent Peale who promoted positive thinking and whose New Age teachings strongly influenced Rick Warren. (Read THIS ARTICLE by LIGHTHOUSE TRAILS RESEARCH to learn more). While there was nothing wrong per se with Shannon Milholland’s comment that she made on Robert D Smith’s interview post, it was concerning to see that she was interested in this type of book and author. This is a quote from one of her books entitled, Jesus & My Orange Juice. 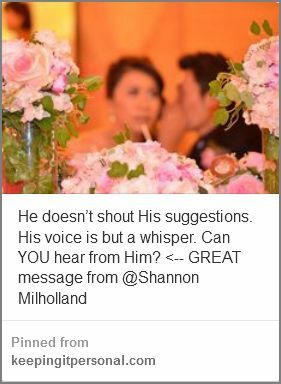 Is it possible that she also promotes “hearing from God” as Beth Moore and Priscilla Shirer do, who are both highly promoted at Harvest Bible Chapel? 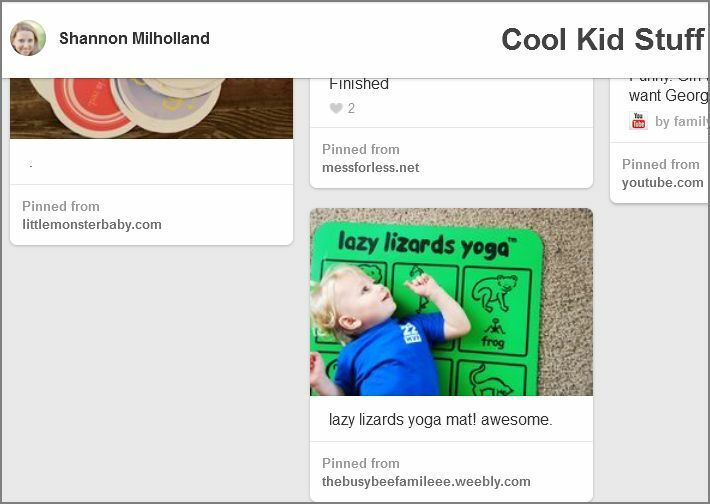 Is it also possible that Shannon Milholland practices yoga? Below is a quick capture of the most concerning information that I found. I will explain in detail just a little further in this post. Also consider watching the Playlist that I posted below under Related Videos which features an interview of Steven Furtick by Lysa TerKeurst, (which is all that I feel is necessary to say about her at this time to make my point that she is not one who should be promoted since she strongly endorses Steven Furtick), and I also added other videos to that Playlist in order to help you see the concerns that many have about his teachings. Although it is uncertain at this point in time what will actually take place at next weekend’s women’s retreat at Camp Harvest, since Harvest Bible Chapel Rolling Meadows promotes Beth Moore and Priscilla Shirer as well as their Bible studies, and since they are both known to promote spiritual mysticism and teaching how to hear God speak to you, as I demonstrated through the information that I shared with you in some of the previous posts that I have written, (such as BETH MOORE LIVE SIMULCAST – WILL YOUR CHURCH BE BRINGING BETH MOORE TO YOUR COMMUNITY, as well as HARVEST BIBLE CHAPEL LEADERSHIP, CHRISTIAN LEADERS, AND THE LACK OF BIBLICAL DISCERNMENT), and since it is possible that Shannon Milholland may lead women into some form of Contemplative, meditative prayer exercise as demonstrated by the information that I provided for you in this post, and because of the fact that Harvest Bible Chapel has made it known that they will be having “meditation stations” at this retreat, I thought that it was very important to try and alert all of you women who are considering going to this retreat so that you can be aware of the possible spiritual dangers that you may encounter, and give you an opportunity to change your mind and choose not to attend this retreat. (SOURCE) <–Click here to continue reading. 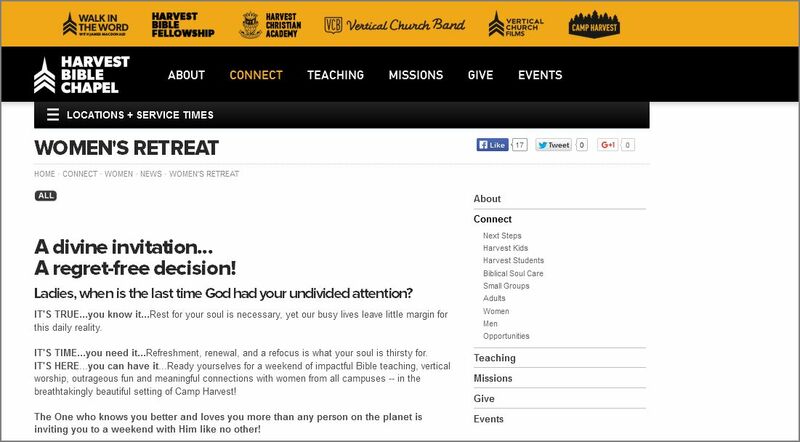 Women of Harvest Bible Chapel, what is being presented to you as a supposed “divine invitation” and a “regret-free decision” may end up being the complete opposite. 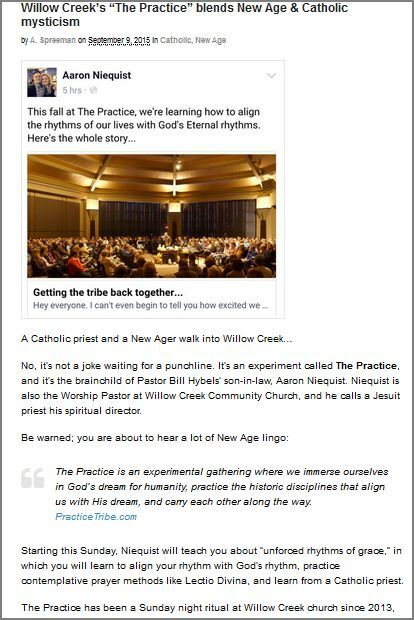 If you accept this invitation and what takes place at this retreat is anything like what is taking place in many other churches these days, I can tell you that it will be a regretful decision, because if you end up going you may be led into participating in spiritually deceptive practices that are akin to what takes place in the world of the occult. If you ignore this warning and the many others who warn about these very same things, you will gradually continue to be led down a spiritually deceptive path. This post goes out to all of you as a strong warning that I hope you will seriously take to heart! If you truly desire an encounter with God, you don’t need to look any further than in the pages of your own Bible. Save yourself $100.00, and, if possible, get up very early in the morning before your husband and your children wake up, take your Bible with you and either sit out in your yard, or take a walk to a nearby park as the beauty of God’s handiwork begins to display pinks and reds across the eastern sky as the sun begins to rise, and spend some one on one time with God by reading His Word and praying and praising Him for the Mighty and thrice Holy God that He is.